Today I released version 1 of my PWA Skeleton side project. 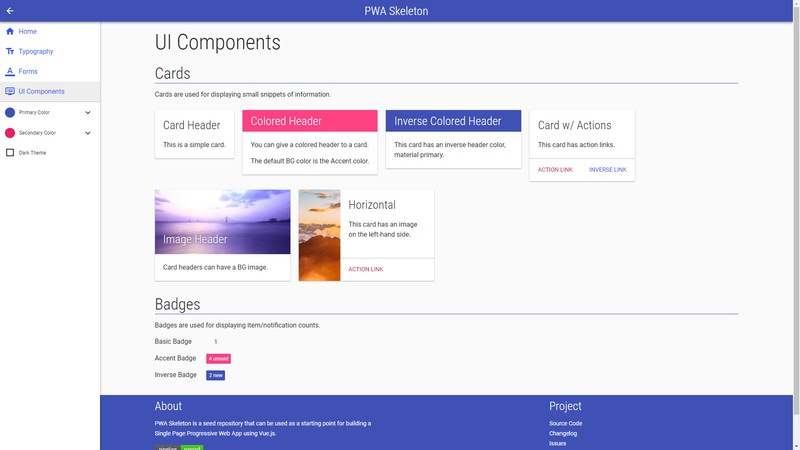 PWA Skeleton is a vue-cli template for scaffolding a new Progressive Web Application project using the Vue.js framework and ecosystem including Vue Router and Vuex for state management. In addition, PWA Skeleton is highly optimized for performance and speed using build techniques such as Code Splitting. It also includes some basic global Material Design inspired CSS styles to get you up and running faster, as well as some pre-made UI component styles such as Cards. Enjoy!